chaosumbreon87 Thanks my dude. I forgot to put Wandering Eye on the side as a flavor win card. Thanks again! obligitory get in the bag nebby joke. 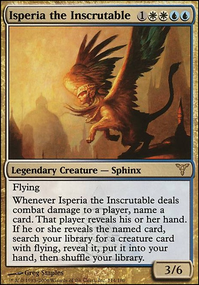 I have a few friends that play cedh and I wanted to know how I could turn my Isperia deck into comp, but they shot me down on how Isperia isn't a reliable tutor or she is too slow or there are many better Azorius commanders. 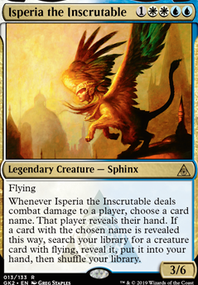 Cards like these have really helped and I have beaten their $3000 decks with my $100 pile of Isperia fun stuff. Like I chose to go Angels semi-tribal, but I have a lot of angel cards I won't throw in for value reasons. Stuff like Serra Avenger and Serra Angel seem to have no place, but tutoring for them and/or playing them helps me by giving me blockers and more options and time to think. 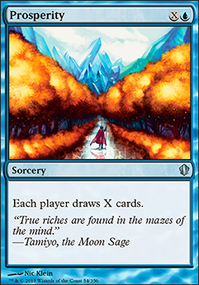 Also, consider Prahv, Spires of Order instead of Azorius Guildgate, which wastes a turn doing nothing while this can give you a colorless since you already have a ton of U/W giving lands and artifacts. Archon of Redemption is really good and i hope that you try to find space for it. Insane life gain here. Wandering Eye-you have to reveal what you tutor anyway. Rudkin on How do you spell that? The mana isn't actually too bad; getting Isperia down early isn't always possible, but I've also found that it isn't always preferable. She's great at refilling your hand and finding answers once the game starts taking shape, but blasting her out early just means she'll likely die early, too. Paying 7 for her hurts, so it's often best to drop her shortly AFTER someone has wiped the board. As for Double Strike, I've been considering Fireshrieker for some time, and I think I may have had it in the deck briefly. The trouble is that it's tough finding non-flier cards sometimes, so I feel I have to be selective about which ones I include. Battle Mastery is kind of a one-shot card here unless I invest in some Enchantment recursion, and there's really no room to cut enough cards for something like that. Zur's Weirding worked well... maybe too well? The amount of table hate that the enchantment generates is astounding, and it really does bog games down, since EVERYONE has a chance to negate EVERY draw. I'd rather have more fun losing than dragging everyone through the mud for hours. Wandering Eye is actually quite the liability. The great thing about Telepathy and Glasses of Urza is that they keep your hand hidden. It seemed that every time I cast Wandering Eye to get some information about what all was going on, I ended up giving up way more information than was worthwhile, often revealing something like Cyclonic Rift, making me public enemy number one. 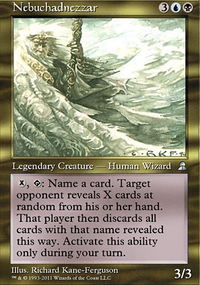 I'm currently looking for a good 3-4 cost flier that can fill the slot of Wandering Eye; right now I'm trying out Skymark Roc, since it can work with Isperia, both by giving me a card to name (the thing I bounced) and/or by clearing a path. I'll have to play some games with it to see if it's what I'm after, though. It might just get replaced with an Azorius Keyrune or some other ramp effect. Maybe Stormscape Familiar? sanobanat0 on Yes, I can tutor about half of my deck. 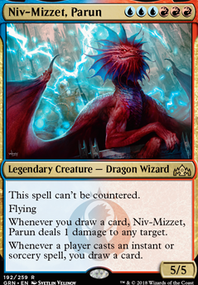 I'm building an Isperia Commander deck right now, but the old Ravnica was the first block I ever bought, so I am really excited about the way you built this. 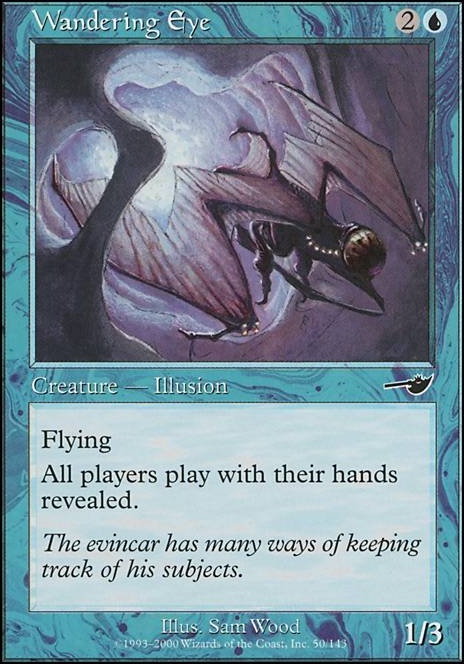 Some cards that would be good in this deck are Telepathy, Wandering Eye, Glasses of Urza, and Halcyon Glaze.